A little while ago, I wrote a post about our wonderfully talented friend, Kirk Shimano, as we got to see a collection of one-act plays that he had a piece in. In that post, I talked about how Kirk used to write in college, but had gotten out of the habit and basically forced himself to start writing again a few years ago. We were happy and honored to be at some of his first readings, from humble beginnings in his living room, and over the past few years Kirk’s work has been in several festivals and has been critically acclaimed. Well, one of Kirk’s one-acts was actually chosen to be produced into a full-length play and was put on this year – how exciting! The piece is about four almost-strangers trying to survive during the Zombie Apocalypse. But because Kirk is (like I said) wonderfully talented, he didn’t just make the play about that – he used the situation to explore social norms and basic human neuroses. 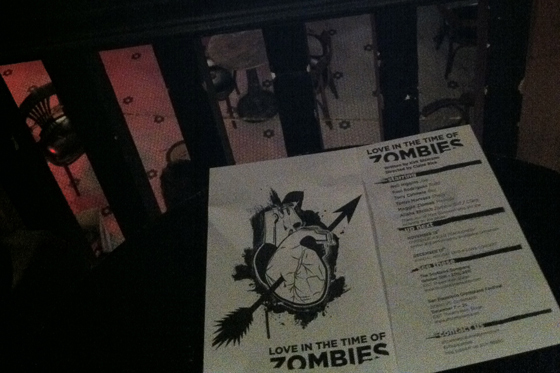 The play is called, “Love in the Time of Zombies” – and we got to see it in its full play form, for the first time tonight. The play was produced by San Francisco Theater Pub, which operates out of Cafe Royal – a great pub on Polk and Leavenworth. There was also a pop-up kitchen with fantastic BBQ tonight (Mondays is BBQ, Tuesdays is sushi – how hilariously awesome is that?). We had ribs, pulled pork, collard greens, and of course, this being San Francisco, Lobster and Crab Mac & Cheese. Righteous! Like this post is titled, Kirk’s play is a “Zom-Rom-Com” – more than likely the only of its kind in today’s theater (and certainly the first I’ve seen)! Ha ha ha! A romantic comedy involving the undead. I told you he’s talented. Without spoiling the play (as I certainly hope this isn’t the last time it’s visited – this piece really is fantastic), I’ll recap to say it’s about near-strangers during a time of crisis, and how even in dire situations, there are some things we as humans simply can’t let go of because of our wiring and history; but how if we are able to shift our focus, to be able to take the leap and get past our normal patterns, how much more we can get out of these crazy, beautiful lives of ours. I wish I had been available to see this production sooner – tomorrow night (Tuesday the 30th) is the last chance to see the show on this run, though I’d love to see it produced and developed even further! It truly is a fantastically funny, unique, smart piece, and a triumph from our good friend and ridiculously talented writer, Kirk. Congratulations, Mr. Shimano! Bravo!